The moons of Pluto, and a potential set of rings, may create dangerous debris zones for a NASA spacecraft currently speeding toward the distant world, researchers say. Scientists are now designing alternate courses for the Pluto-bound New Horizons spacecraft that would steer it out of harm's way, while at the same time helping the probe explore its mysterious targets. "We want people to understand just how interesting and how nail-biting New Horizons' mission might be," study lead author Alan Stern, principal investigator of the New Horizons mission at Southwest Research Institute in San Antonio, Texas. "This is part of the excitement of first-time exploration, of going to a new frontier." New Horizons is currently about 1,000 days away and 730 million miles (1,180 million kilometers) from closest approach to Pluto. Since the spacecraft blasted off in 2006, the distant world has become an even more enticing goal, with a fifth moon discovered around it in July. The impacts that may have created this system of moons as well as collisions they have likely had with other bodies in the Kuiper Belt where the distant world resides also suggests debris might have collected into rings around Pluto. Although these finds reveal that Pluto is a trove of treasures worth exploring, "we're worried that Pluto and its system of moons, the object of our scientific affection, may actually be a bit of a black widow," Stern said. "We've come to appreciate that those moons, as well as those not yet discovered, act as debris generators populating the Pluto system with shards from collisions between those moons and small Kuiper Belt objects." 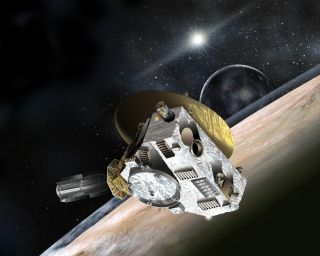 Given how New Horizons is currently zooming away from the sun at more than 33,500 mph (54,000 kph), "a collision with a single pebble, or even a millimeter-sized grain, could cripple or destroy New Horizons," said New Horizons project scientist Hal Weaver at Johns Hopkins University Applied Physics Laboratory. "We need to steer clear of any debris zones around Pluto." To search for debris orbiting Pluto, the New Horizons team is now scanning it with ground and space telescopes and carrying out computer simulations of where this shrapnel might lie. "We're not going to blindly send a billion-dollar-class missioninto harm's way," Stern told SPACE.com. "We're going to rewrite what we know to achieve victory." Although researchers have spotted no signs of debris zones around Pluto yet, computer models have not ruled out such gauntlets of rubble. "We have to take the conservative approach and assume the worst," Stern said. The researchers are now also making plans to avoid these hazards if New Horizons needs to. "We are now exploring nine other options, 'bail-out trajectories,'" Stern said. New Horizon's current plan would take it about halfway between Pluto and the orbit of its largest moon, Charon. Four of the bail-out trajectories would still take the spacecraft between Pluto and Charon's orbit. "They would get maybe up to about 15 closer to Charon's orbit, but that can make a large difference in terms of safety," Stern explained. "These zones would get scoured of debris by Texas-sized Charon. The other alternatives would take New Horizons much further away from Pluto, past the orbits of its known moons. "If you fly twice as far away, your camera does half as well; if it's 10 times as far, it does one-tenth as well," Stern said. "While placing New Horizons farther out would still accomplish the primary objectives we have for it, it would not exceed them. On our current path, we'd get imaging resolutions down to about a tenth of a kilometer (330 feet) for some places on Pluto, but if we fly substantially far away, we'd meet the 1-kilometer (3,300 feet) objective we had." "Still, half a loaf is better than no loaf," Stern said. "Sending New Horizons on a suicide mission does no one any good. We're very much of the mind to accomplish as much as we can, and not losing it all recklessly. Better to turn an A+ to an A- than get an F by overreaching." It remains uncertain what levels of risk might prompt the researchers to change New Horizons' course — say, a 25 percent chance of hitting a millimeter-sized grain, or a 10 percent chance of hitting a centimeter-sized pebble. "We're working on making recommendations to NASA regarding that later this year, and then with NASA the project team will make that decision if the time comes," Stern said. The latest the research team can alter the spacecraft's trajectory is about 10 days before it gets to Pluto. "After that, there's not enough fuel to make a change," Stern explained. "We don't often get into situations in spaceflight where we have to make last-minute decisions. We're going to learn as much as possible before our final approach in 2015." The scientists detailed their research today (Oct. 16) at the annual meeting of the American Astronomical Society's Division for Planetary Sciences in Reno, Nevada.